I would assume... most cooking and baking mum can bake a classic shepherd's pie. Am I right? However, if you don't know anything about shepherd's pie (also known as cottage pie), it is an UK originated mince lamb or beef pie that is baked with golden brown mashed potato crust. These days, whether you are English or not, shepherd's pie is consumed everywhere, in most markets, cafes, pubs and at home. The good thing about a good old shepherd's pie is it is actually very easy to cook and bake. It can be made healthily with lean meat mince and lots of vegetable, for big or small families and also everyday consumption. Have you been cooking and baking healthy and delicious shepherd's pie for your family? If your answer is no, do you want to know how I baked mine? 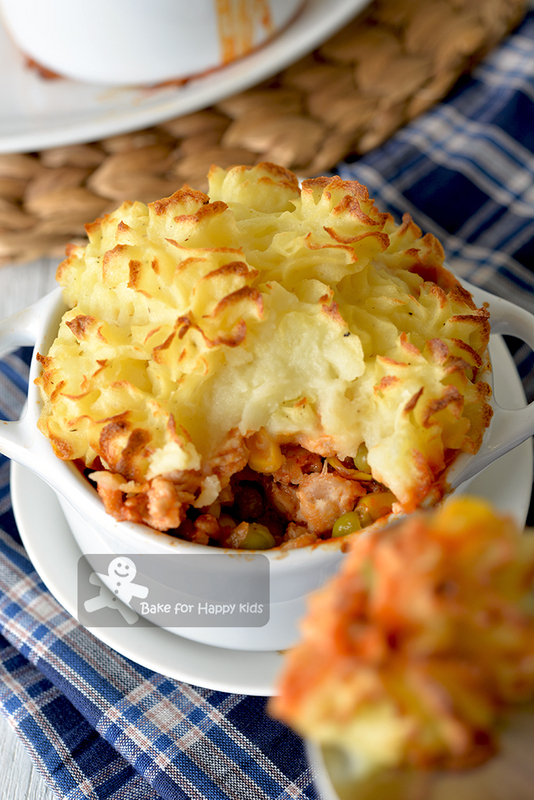 lean chicken mince, lots of vegetable and creamy potato topping with LESS butter! 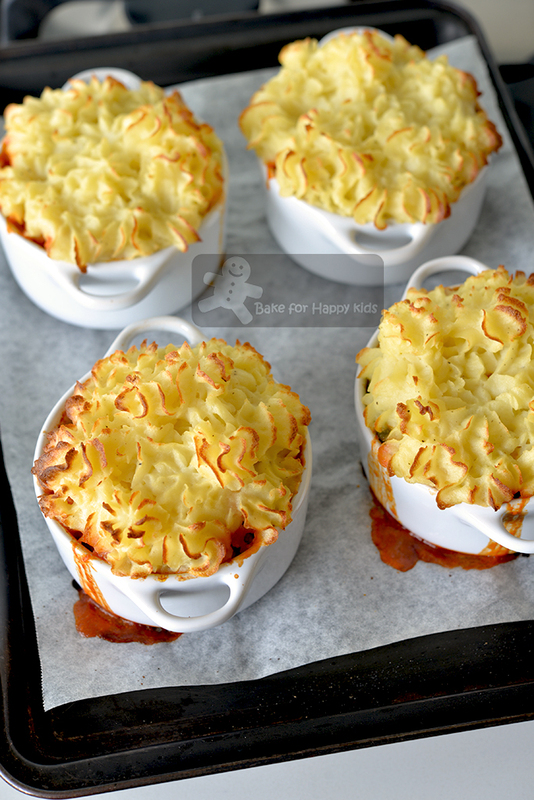 If you have searched Google for shepherd's pie recipe, I'm sure that you will find heaps!!! And you might think that my shepherd's pie recipe is somehow like the others that you have found via Google... Nothing special? Well, I must admit that you are right! 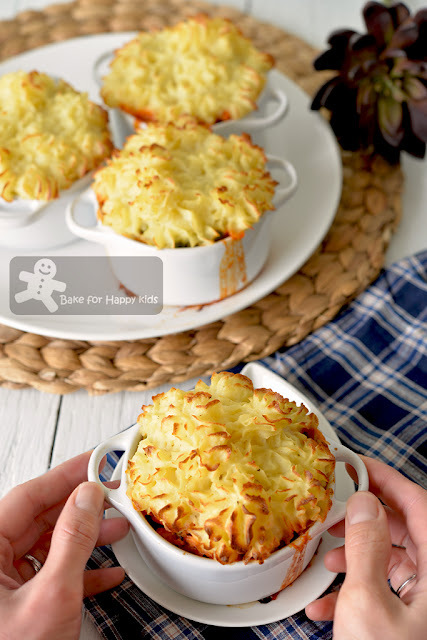 I'm sharing my easy straightforward home-style recipe plainly because I know that I can bake an easy healthy and delicious shepherd's pie and it is really up to you to decide if you want to use my recipe. Interested? Here's a video showing how I cooked and baked my HEALTHY chicken shepherd's pie and it's EASY and TASTY! Our delicious dinner is ready! To me, my shepherd's pie is PERFECT! It's made with lean chicken, lots of vegetable and golden brown creamy potato topping. Less butter and most importantly, YUMMY! Whenever I baked my shepherd's pie, no one seems to complain about anything including the peas! LOL!!! It is usually so yummy that it is gone very quickly! So, do you think that I should share my recipe? Here's my recipe with many helpful cooking / baking tips. * This essential amount of butter is required to make the potato crust nicely browned and delicious. ** You can cook this dish with lean beef or lamb mince with beef stock instead of using chicken mince and chicken stock. *** You can use replace frozen vegetable mix with fresh peas, corn kernels, diced carrots. If you are adding diced carrots, you will have to cook the carrot in boiling water first until semi-softened. Personally, I find that the frozen vegetable mix is the most convenient to use and their nutritional contents, taste, texture and price are actually as good as the fresh ones! Place potatoes in a medium cooking pot with enough cold water to cover. Add 1/4 tsp salt and bring it to a boil with high heat. Reduce heat to medium-high and cook until the potatoes are very tender, about 15 mins. Tip: While the potatoes are cooking, you can cook the filling. Drain potatoes thoroughly. While the potatoes are hot, transfer them into a large zip lock bag. Add butter, milk, salt and pepper to season. Seal the bag and mash until the potato mixture is smooth. Set aside to cool completely. When the potato mixture is cooled to room temperature, add egg yolk and mix until combined. Tip: Add more milk if required and mix until it has reached its optimal smooth consistency to pipe. Preheat oven to 200°C / 400°F. Tip: Line baking tray with baking paper for easy cleaning. Combine chicken mince and cornflour. Set aside. Heat 2 tbsp oil in a large frying pan with medium high heat. Cook onion for about 3 mins or until golden brown and fragrant. Add garlic and cook for about 1 min or until fragrant. Add chicken mince and keep breaking the mince into small pieces as it cooks. Cook for about 3-4 mins until the mince is slightly golden brown. Stir in frozen vegetable mix and cook for about 5 mins or until the vegetable mix is thoroughly thawed and lightly seared. Add tomato paste, chicken stock, Worcestershire sauce, rosemary and thyme. Stir to combine. Bring to a boil, then reduce heat to low, cover and simmer for 10-12 mins or until the sauce is slightly reduced. Season with salt and pepper. Remove from heat. Divide chicken filling evenly into 4-6 ramekins, depending on the capacity of the ramekins that you used. Place the filled ramekins on the prepared baking tray. Top chicken filling with the potato topping by piping with an open star nozzle. Tip: Do not skip this piping step by spreading the potato mixture on top of the filling. The multiple-star design on the potato topping will make the crust more delicious because the thin edges of the piped mash will make the crust brown and crisp better. During piping, please make sure the filling is well-covered by the topping so that the filling won't bubble out into the topping. Place baking tray onto the prepared baking tray and bake for 25 mins or until the potatoes begin to brown and crispy on the top and edges. Happy Baking! Hope that you will like this easy recipe and my baking tips.